I've had friends and acquaintances ask me what my design company, Pancake Wheel LLC does: some have seen pictures or a news article. I thought I would write an article that explains the long arc of how design innovations eventually become state of the art products. 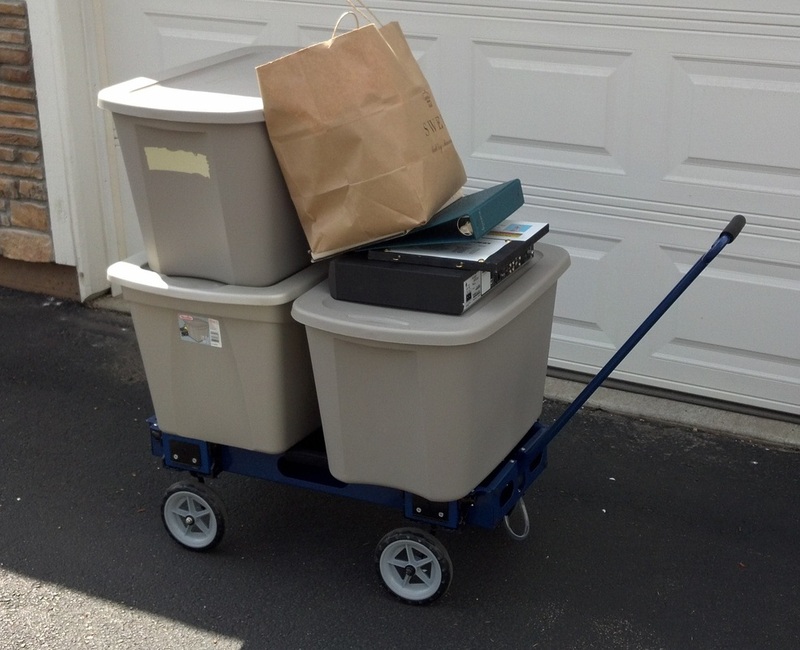 My field of interest is narrow: designing compact, fold flat consumer wheeled products (carts, wagons, strollers, joggers). Several years ago I was approached by the owner of an Austrian golf products company. The company, Big Max, is very successful in the European golf cart and golf accessory market and they were considering expanding their reach into baby strollers, initially to be offered in Europe. Licensing several of my U.S. and China golf cart and baby stroller/jogger patents could be strategic to a new fold flat stroller design. While many consumers wouldn’t notice, the wheel design of portable golf carts can be similar to the wheel design of some baby strollers or baby joggers. The owner of the Austrian golf company had an idea for introducing a new, ultra-compact collapsible baby stroller and already had a very rough first idea for the design, and a factory we worked with already had an early prototype. I was invited to both license my existing patents, and also work as a co-designer to try to refine and improve the factory’s first rough idea. As part of the planning, I agreed to travel to a factory in China working with the Austrian golf company, and then to engage in remote design work, via email or skype. At the very first design plan meeting, the factory had already worked up a very rough frame idea for folding the wheels in a very simple way. One of those rough first prototypes of a 3-wheel stroller is shown below, which would have a push pull portion of the lower frame fold all the stroller wheels. First factory working prototype, metal tube serves as push-pull handle to fold and setup wheels. The broad design concept was a great idea but the specific mechanical approach was very poor from an aesthetic appearance standpoint, and would be difficult for a parent to manipulate. After seeing the very rough mechanical prototype, I resolved to start brainstorming on a better solution, using the broad idea, but to refine or replace it with a simple design that would be patentable and easier for mothers or fathers to use on the stroller. I had a brainstorm to merge or meld the simple push/pull metal frame handle idea with the type of handle commonly used on typical luggage (see below) onto a baby stroller. My design idea: merge the recess push pull handle of rolling luggage, so that the push pull handle sets up and folds all baby stroller wheels. Working idea sketches after first design meeting at factory, wishbone lower frame with center front connector. I traveled to China for a second design meeting, and we worked on implementing this concept of the single push/pull handle which would recess into the front of the stroller. Some work on the refinements are shown below. Imprementing a key design innovation: merging a recessed wheel folding push-pull handle into the front of the stroller frame. ​ Many months after the very first push/pull handle design was built, the factory tried a number of mechanical methods to arrive at the simplest manufacturable method, and one that would be easy for consumers. This literally took somewhere between 1 ½ to 2 more years, because some of the designs functioned well but were too hard to manufacture, or had too many parts that might suffer damage during use. Then, in most every European nation, before a product can be sold, it must pass a rigorous inspection process, like UL in the USA. A manufacturer must address any problem areas that the design laboratories find that may not meet any criteria set forth for that type product. Evaluating pinch points, impact and vibration testing are some of the testing mandated under the standards applying in Europe. The long arc of this state of the art fold flat baby stroller process lasted almost 3 years, and involved design engineers at the factory, and another German designer brought in to adopt the simplest reliable mechanical internal parts. Ultimately the new design, co-invented and co‑designed by myself and my design company, Pancake Wheel LLC, along with two other co-inventors, was introduced in Europe under a new baby stroller brand called Nikimotion, see the setup video for details. Rick Shapiro of Pancake Wheel LLC is an independent designer-inventor with 19 U.S. patents who works with companies to develop state of the art fold flat wheel products. So what’s been happening at pancake wheel LLC in the last year and a half? A lot actually. 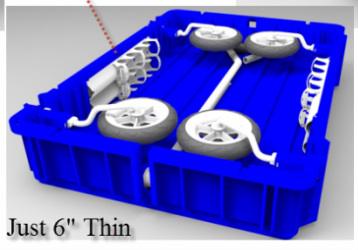 First, our designers are working hard to redesign the pancake wheel folding wagon which has previously been offered in several different variations: plastic and metal. Rick Shapiro has been designing the new wagon for over a year, incorporating consumer ideas and feedback into the new wagon design. hold accessories and a storage shelf. We hope to show images of the new design in 2014 and announce where it can be purchased. Also, Pancake Wheel signed a design and development patent agreement with Big Max Golf and began developing a baby stroller with unique fold flat attributes, planned for launch in 2015.
the Pancake Wheel foldable wagon. am I glad I brought it though. When we got up to Virginia Tech we were required to park about as far away from the entrance to her dorm as you could get. 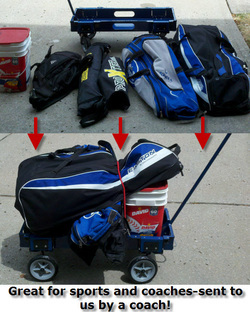 the wagon. 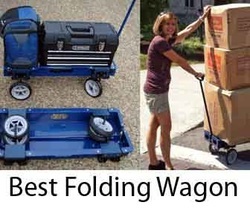 It may very well be the best folding wagon because it holds up to two hundred pounds but was nimble enough to turn corners and fit though all the doors. 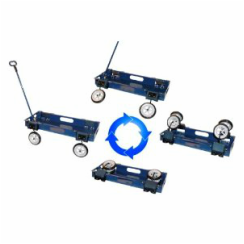 To get you very own pancake flat cart by pancake wheel you can buy online from www.foldflatworld.com or you can find it on Amazon Marketplace as well.